When a blog post featuring Clayton Cafe, 76 E. Kentucky St., was an option this month, I was intrigued. I knew very little about this establishment and my family always enjoys venturing to locally owned Hendricks County restaurants. Clayton Cafe, owned by Ryan and Jennifer Rash, boasts fresh, home-cooked meals at affordable prices. This sounded like the perfect spot for a family dinner! Kids eat free on Mondays from 5-8 p.m., so that was certainly a bonus. Our entire dining experience was great from start to finish. This family-friendly cafe has a cozy, diner feel to it. The Rashes, who have been Clayton residents for 12 years, bought Clayton Cafe a year ago from Steve and Betty Hoop. They made several improvements to the outside of the building and dining room. New paint, flooring and decor give the dining room an "updated" atmosphere. We were sat and greeted by a server immediately. She was friendly, helpful, knowledgable and efficient. We were given the everyday menu and a separate kids menu. The all-you-can-eat and dinner specials were listed on a menu board as well as desserts. Breakfast is served all day if you want even more options. 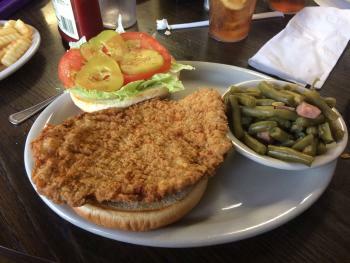 Earlier in the day, I researched the menu on their website and immediately decided on the breaded Hoosier pork tenderloin. All sandwiches include one side, most of which are homemade. I chose green beans. They were cooked and seasoned just right and mixed with generous pieces of ham goodness! The breaded pork tenderloin was one of the best I&apos;ve ever eaten (and I&apos;ve consumed many in my lifetime, so I&apos;m pretty particular). This scrumptious tenderloin was breaded and fried till perfectly crisp. Combine that with a delicious light and crunchy breading and choice of toppings (lettuce, tomato, pickle, mayo, cheese), and you have the perfect sandwich! Since Clayton Cafe is famous for their fried catfish, we absolutely had to try it! The server informed us that we could order an individual piece which was exactly enough to get a taste and still have room for the our meals. Just like the tenderloin breading, the catfish breading was light and flavorful. It was accompanied by an amazing tartar sauce. If you are a catfish fan, you have to try it. Your taste buds will thank you! They offer two- and three-piece meals daily and include 2 sides and hush puppies. The all-you-can-eat special occurs on Fridays. My husband opted for one of the nightly specials, the chicken and noodles. This special included 3 sides (he chose cole slaw, green beans and mashed potatoes with gravy) and a roll. This home-cooked, comfort dish was just as good if not better than "grandma&apos;s" chicken and noodles. We strongly recommend this savory, satisfying dish. Cole slaw is another one of Clayton Cafe&apos;s famous items, and I can can see why. This vinegar-based, tangy homemade slaw was delicious! My kiddos ordered from the kids menu. Meals include one side and a drink. They wanted their usual, grilled cheese with fruit and chicken tenders with french fries. Since they never finish their meals, my husband and I indulged in a few bites. Everything was fresh and tasty! We managed to save a little room for desserts! I love all pies and knew I would order whatever was available. 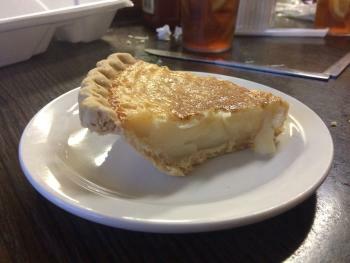 Luckily, sugar cream pie was an option (which happens to be Indiana&apos;s state pie, who knew?). The combination of a perfectly textured custard filling and flaky crust was absolutely divine. My kiddos decided on apple stix. This plate of pure deliciousness consisted of fried apples, sprinkled with cinnamon and sugar topped with a scoop of ice cream. I&apos;m guessing you really can&apos;t go wrong with any of their dessert offerings! Clayton Cafe&apos;s menu consists of breakfast items, appetizers, salads, sandwiches, and home-cooked meals. For a complete list of menu items and pricing (indeed very reasonable), click here. 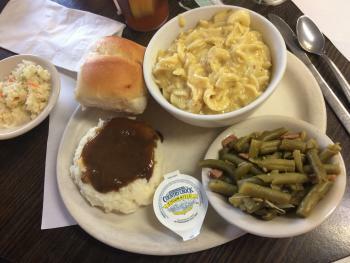 Some popular and recommended dishes besides their tenderloin and catfish include breakfast favorites like their famous homemade biscuits and scratch gravy and western omelet. Regulars also rave about Shelly&apos;s homemade potato skins, David&apos;s double 1/3 cheeseburger, Betty&apos;s grilled chicken breast, Steve&apos;s meatloaf sandwich, Ryan&apos;s ribeye sandwich, country fried steak and grilled ham steak. Drinks offered include premium Coffeehouse coffee, juice, Coke products, lemonade, iced tea, bottled water and bottled Coke. They are open Monday-Saturday. For specific hours and additional information, go to their Facebook page. Breakfast is served all day, lunch specials begin at 11 a.m., and all-you-can-eat specials begin at 4 p.m. Monday-Thursday and 11 a.m. on Fridays. Parking is available on the street and in a lot. Catering and carry-out is offered. Clayton Cafe has it all...scrumptious home-cooked food, excellent service, reasonable prices, family friendliness, and, best of all, it is locally owned. Stop in and enjoy. You&apos;ll be glad you did!